Alison Brooks Architects has collaborated with The American Hardwood Export Council, Arup and the London Design Festival to present a cross-laminated tulipwood structure on the Rootstein Hopkins Parade Ground of the Chelsea College of Arts October 12. 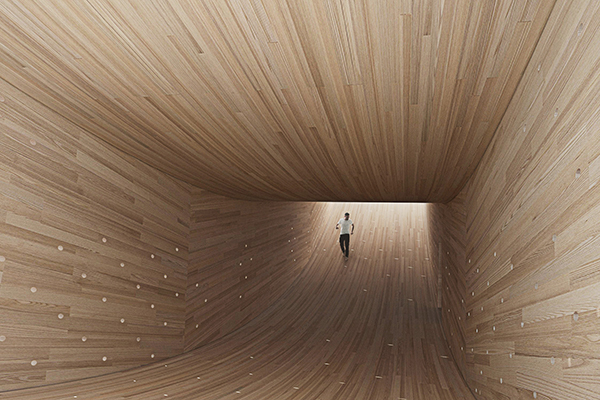 Alison Brooks Architects has designed ‘The Smile’, an urban installation that showcases the structural and spatial potential of cross–laminated hardwood using American tulipwood. The Smile is one of the Festival’s Landmark Projects; a timber structure that can be inhabited and explored by the public. With expertise from top engineering firm Arup, and using construction sized panels of hardwood CLT for the first time, Alison Brooks’ concept is a spectacular 3.5m high, 4.5m wide and 34m long curved rectangular tube – the first ever hardwood ‘mega-tube’. Alison Brooks says, “The Smile is a huge curved hollow tube made of cross-laminated tulipwood. It touches the ground at one point, like a wheel. Entering The Smile through an opening where the curved form meets the ground, the visitor can walk from end to end of the 34-metre-long tube to discover a new kind of space that gradually rises toward light. All four sides of The Smile’s interior will be made of the same beautiful hardwood panels as the structure. It will offer a complete sensory experience of colour, texture, scent and sound. The Smile’s two open ends will illuminate the funnel-like interior space and act as balconies to the city. This creation of a brand-new product and a new use of hardwood will transform the way architects and engineers approach timber construction. “This structure proves that hardwoods have a role to play in the timber construction revolution,” says David Venables, European Director of AHEC. 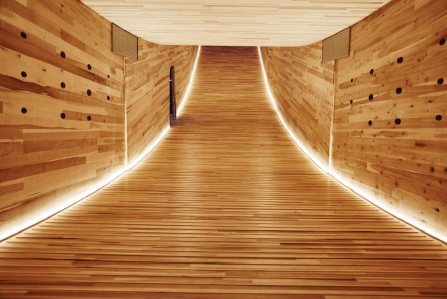 “All our previous LDF projects – Timber Wave, Out of the Woods, Endless Stair and The Wish List – have been significant projects. Arup’s engineering team is working to derive the most efficient structural form, using only 60 cubic metres of wood to create a 150 square metre enclosed space. The forces of tension and compression working in the CLT walls will be expressed by perforations in its elevations. ABA has used these to generate patterns of light across The Smile’s interior spaces during the day, it will become an urban lantern at night. Alison Brooks’ “The Smile”. Photo courtesy of Friends & Co.
Cross-laminated timber is an engineered timber that can be used to make the walls and floors of entire buildings. It has a layered construction with the wood fibres turned at right angles in each successive layer, creating a panel with equal strength in both directions, just like plywood. Weight for weight, CLT is stronger than concrete and it can also be machined to incredibly high tolerances. This makes it ideal for prefabrication and rapid assembly, reducing construction times by up to 30 per cent. CLT is usually made of a softwood called spruce, better known as the Christmas tree. Together with Arup, AHEC has started a process of experimenting with CLT made from fast-grown North American tulipwood. Testing has shown that the tulipwood is considerably stronger than spruce; it also has a superior appearance. 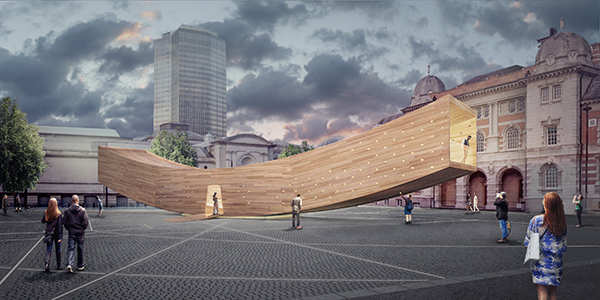 The Smile is the first project in the world to use large hardwood CLT panels, in fact the entire structure is made from just 12 huge tulipwood panels, each up to 14m long and 4.5m wide. Fabricating these panels in a real CLT production plant has been an important step forward, showcasing how the material can be used for commercial projects. Founded in 1996, Alison Brooks Architects has developed an international reputation for design excellence in projects ranging from urban regeneration and public buildings for the arts, to higher education and housing. ABA’s architecture is informed by their intensive research into the cultural, social and environmental contexts of each project. Known for their sculptural approach to form and extraordinary attention to detail, Alison Brooks Architects is the only U.K. practice to have won the RIBA’s three most prestigious awards for architecture – the Stirling Prize, Manser Medal and Stephen Lawrence Prize. Alison Brooks is a graduate of the University of Waterloo, where she received an Honorary Doctor of Engineering in June 2016.